Massimo elegant dining chair features a quilted design detail on the back support. The chair has midcentury modern lines with elegant new materials. The velvet upholstery gives the chair a luxurious feel and look while the stainless steel finish on the frame adds a touch of contemporary to this elegant chair by Allamoda Furniture. Available in Black and Gray colors. Massimo elegant dining chair features a quilted design detail on the back support. The chair has midcentury modern lines with elegant new materials. The black velvet upholstery gives the chair a luxurious feel and look while the stainless steel finish on the frame adds a touch of contemporary to this elegant chair by Allamoda Furniture. Massimo elegant dining chair features a quilted design detail on the back support. The chair has mid-century modern lines with elegant new materials. The velvet upholstery gives the chair a luxurious feel and look while the stainless steel finish on the frame adds a touch of contemporary to this elegant chair by Allamoda Furniture. Available in Black and Gray colors. 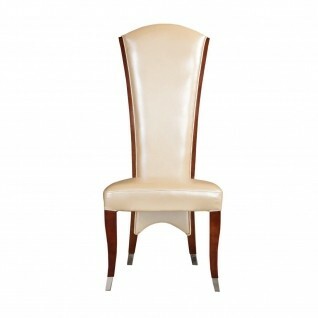 Aliosso dining chair has a solid wood frame with walnut veneer details and high gloss lacquered finish, it is upholstered in a pearlized beige genuine leather. Navi contemporary dining chair features a brushed stainless steel base with black faux leather upholstery. Available in Brown and Beige colors. Frida luxury dining chair has a silver polished stainless steel frame and soft dark-gray pearlized tufted faux leather upholstery adorned with clear crystals. Available in Gray and White colors. Horizon stylish mid-century design dining chair features brushed stainless steel base, walnut painted wood veneer back and black faux leather upholstery. Available in Black, Beige and White colors.